High Tide" is a 2011 24" x 24" oil painting on board. I have a style called "Bent Realism" that focuses on the warping of the physical to reflect more of the internal mood or personality. 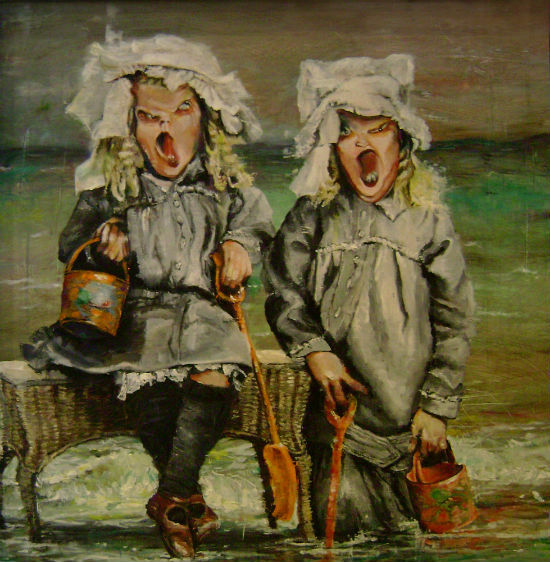 In this case, these are two monstrous little girls who have been sent to a "naughty spot" that is slowly being surrounded by high tide. It was inspired by watching Jo, the British nanny on TV. She is amazing and helps countless families, but I had to give it my "bent" twist. I am a very immature 59-year-old.